More pedal strokes than key strokes makes for lots of blog fodder but not much time to get it down. Guess that means I need to be selective, all thriller and no filler (hopefully). Way back on last weekend, the 4th annual Liberty Jamboree took place. The original date had fine weather and a few of us rode some of the course, but as usual when the actual event took place it was like we were riding through a pot of boiling water. Hot as hell and wet with humidify, pretty much par for the course. The Jamboree is a single speed stage "race" based on the punk bike enduro concept. Race for points, capture punks for points, drink beer, have a good time with your friends. The Jamboree has it's own twist though, the winner is determined by betting the points accumulated in the race in a round of black jack against the dealer. The dealer and MC for the event is super dood Jim with support from his wife and a few friends and the generous use of his in-laws property for staging and the post ride cookout. 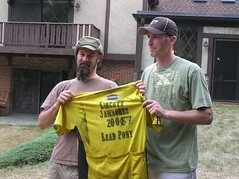 Usually 30 - 40 VA and MD single speed knuckleheads show up to have a go a wearing the coveted yellow jersey, the reward for a stage victory. The jersey has been unwashed since the events inception and the hellish hot weather of the event coupled with the brutal pace of the stages guarantees that this garment has a permanent stench embedded into it's artificial fibers. I came into the event carrying the yellow from last year's victory which meant I got to start the day feeling extra fresh. Last year SSO team mate Becky was the first woman to race the event and rocked the event. This year she couldn't make it but 5 SSOFT ladies showed up and made up the entire women's field. A few other ladies made a good show riding the course too, but they were on gears so weren't up for the points competition. Things have been dry and dusty here lately so the course was fast and loose. As usual we were out of the gate fast. Ricky d took the hole shot but I quickly passed him as we spun the flats. I grabbed a decent lead on the downhill of stage one but once we started climbing Jonathan and Nick caught me and passed. I chased but stayed in third to finish with burning lungs and like every year, figuring I was going to suffer like a dog for the rest of the day. The stages generally last from a 1/2 to maybe 2 miles tops and are all out sprints. Certainly not my strength and definitely an advantage for a lot of these guys that have just wrapped up racing the Wednesday at Wakefield hot lap race series. The next stage had me in the back of the pack, fighting to pick my way up when ever possible on the narrow singletrack. Worked my way up but not enough by the finish as I slid in to 6th place and just out of the points. New comer and young buck Tom had a pretty spectacular crash that torn his arm open but he got it patched up and did the whole race. Hooray for youth! Stage 3 had us do a Le Mans running start where we were required to swap bikes with someone who had he same pedals. I made a deal with Chris and thought I was set to have a familiar bike. No go, Gwadzilla grabbed Chris' bike and left me wondering what that hell I was going to ride. After I located the big guy's bike I got the pleasure of having a seat jammed up my bum on the Sasquatch sized frame as I hammered up the hill. I got my revenge as I passed Gwadz at the line to snag 2nd place. Back at the start, we took a beer break. From here it was a lot more of the same: mad dashes for points that left the lungs burning. didn't get to wear the yellow again for a few more stages until we were in McKeldin. When we lined up for the Plantation trail stage I got focused, this is a mostly downhill ripper of singletrack that is buff and fast with some patches of roots and rocks and probably one of the longer stages. I hammered the start and snuck past Ricky to take the lead when he got jammed up on some roots. After that I owned the stage which was the plan from the start. I think I've won this stage every year, I just feel dialed on it and was hoping I could pull it off again so I can grab some big points. I did it and also managed to snag a punk on the fly which doubled my points for the stage. I was pretty happy at that point and felt I could breath easier. Good thing too, because I needed it. Joe P got the one-two punch of Gwadz knocking him down and Jonathan running over his rear wheel. Busted spokes, game over. Through the river and through the woods, we headed to the Woodstock side of the park for another stage and some fun group riding followed up by a derby stage. Donna was the last rider standing and made history by being the first woman to wear the yellow jersey. More group riding, lots of waiting for the heavy horse traffic, back through the river, climb to the furthest point stage (snagged this one too), one severely bonked rider (gave her some Carbboom for a miraculous recovery) and then more group riding back to the beginning for a much needed and deserved swim in the reservoir and bunches of beers. Grills were fired up, more beers were drank, lots of food was eaten and black jack was played. I was first in points for the men going into the black jack game but didn't have enough of a lead that I could just play it safe. I gambled big but got beat by the dealer and dropped from 1st to 4th in the final standings. Hammer dog Jonathan pulled out the win. Going into the ladies final Donna and Julie (Mrs. Outlaw) were tied but Donna squeaked out the win which she certainly deserved after wearing the yellow. Big thanks to Jim, Amy, her family for hosting and the course marshals who helped out. Also thanks go to the Pedal Shop for the swag and Old Dominion Brewing for the beer. Always a blast. Go put one of these events on yourself, you'll have a great time.